The first few chapters give an introduction to higher dimensions, looking at what they mean and how all but three of the dimensions of space might be curled up so as to be undetectable. 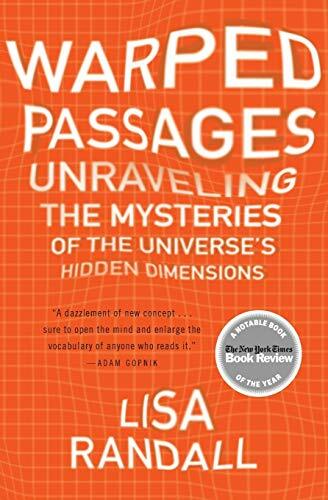 There is also a chapter on how such hidden dimensions relate to new ideas in physics such as string theory and a chapter introducing the idea of a brane. However, to proceed further the reader needs to find out about quite a bit of modern physics. Thus Randall gives an explanation of special and general relativity and quantum theory, all of the time keeping the technical details to a minimum. She then moves on to the standard model, which unifies the electromagnetic, weak and strong forces, explaining how particle physics can be explained in terms of quarks and leptons interacting via forces mediated by photons, gauge bosons and gluons. Of course there is none of the mathematics of quantum field theory, but Randall makes good use of Feynman diagrams to explain the nature of the subject. Experimentally the standard model has been a huge success, with the ability to explain just about every result that has been obtained since it was devised. Theoretical physicists, however, still have their doubts about the model. It seems to depend too much on arbitrary parameters, and what's more some of these parameters are a long way from what theorists would 'expect' them to be. Thus we learn about the hierarchy problem - the chapter on spontaneous symmetry breaking explains why particles have a mass but a huge fudge seems necessary to get the masses to be so much less than the Planck mass. Considerations of symmetry also lead to the idea of supersymmetry, which says that each particle which we know about has a partner which is yet to be discovered. Thus we are introduced to string theory as a possible solution to the theoretical problems of the standard model. String theory has been criticised by some as untestable, but Randall makes clear that there are many ways in which theories which go beyond the standard model can be tested experimentally, especially with the Large Hadron Collider coming on line later this year. The final third of the book looks at the theory of branes. This can mean two slightly different things, firstly branes as a higher dimensional version of strings - submicroscopic vibrating objects in which the higher dimensions are curled up out of sight - and secondly 'bulk' branes, where we need an alternative explanation of why higher dimensions are not visible. Randall is primarily concerned with the second type of brane, and introduces various scenarios in which the world we know of quarks, leptons and the three nongravitational forces lies on a three dimensional brane, but where this lies within a higher dimensional space in which gravity can propagate. In a sense gravity 'leaks out' of our brane, explaining why it is so much weaker than the other forces. Again there is none of the advanced mathematics needed for a full understanding of this subject, but there are plenty of intriguing pictures, showing how such an idea might deal with some of the theoretical problems of the standard model. Randall does an excellent job of making a complicated subject accessible to the non-specialist reader, and I thought it was slightly easier than, say, Brian Greene's The Elegant Universe as an introduction to string theory and related physics. A word of warning though if you are starting from a position of not having read about the subject before. Although the work is non-technical, there's a lot to take in in this 500 page book, and you might find yourself struggling to keep it all in mind. I feel that the book doesn't have the sort of structure which allows you to read it in parts with breaks to assimilate what you have learned, and it might be better to start off with shorter books on the subject. If you've already done this, then Warped Passages will provide you with plenty of new food for thought.